Superstar Yaakov Shwekey is busier than ever. Hot on the heels of his hit albums, Live in Caesaria and Ad Bli Dai, Aderet Music is releasing The Collection, a three CD set. 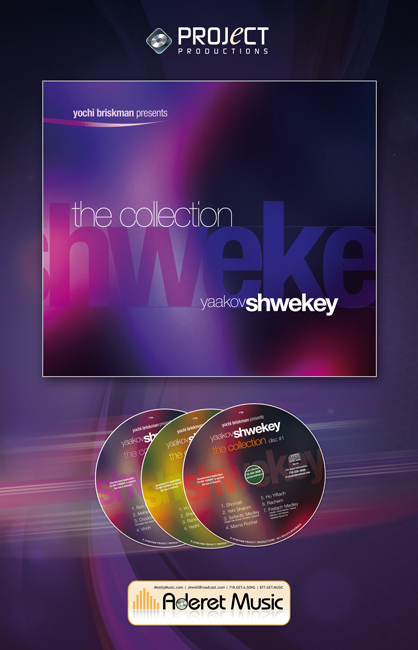 Featuring many of Shwekey’s most popular songs and a new song that appeared on the Harei Yehuda album, The Collection showcases many of the songs that have made Yaakov Shwekey a household name. In the spirit of the month of Adar, this three CD set is sure to bring simcha to anyone who listens to it and makes a terrific holiday gift! Seems like an interesting idea, but if it’s all old material, I already have it all. Basically, someone went and burned a mix of his songs, and duplicated it, something which any individual who bought all the Shwekey CD’s can do themselves. So I’m not really sure which crowd they’re targeting. But if you don’t yet have all the CD’s, it’s a nice way to get all the hit songs. Another interesting thing is that there are no songs from his last 2 studio albums (L’Sheim Shamayim, and Ad Bli Dai), or the Caesaria album. It’s all from the first 3 studio albums, Shwekey B’Simcha, Shwekey Behisorerus, Shwekey in Paris, and Harei Yehuda. For those of you who like to keep track of these types of things. The illustrious career of Yaakov Shwekey now includes five CD’s of original material and seven Cd’s of old material. Wow.